This joggle style memorial has a worked book to the face of the headstone with curved pages and a cord & tassle running the centre of the book. Shown in south african dark grey granite. 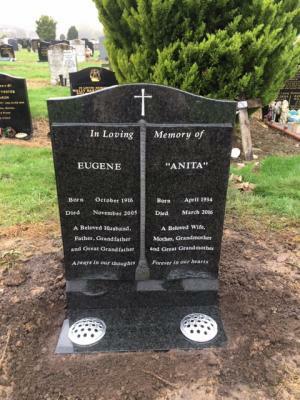 In this section of the cemetery the headstones are fitted into a concrete shoe type foundation into the ground, the vase plate is then fitted to the front of the headstone.